The Lakes Inn Way is a 90 mile circular walk starting and finishing in the popular tourist town of Ambleside. This trail takes in some of the more remote corners of the Lake District, and takes you through the Lake District’s stunning deep sided valleys, along lake shores and over remote mountain passes – as well as past over 40 traditional Lakeland inns.Please be aware that this is a challenging route in places, you will need to be profficient in map reading and the use of a compass. Do not hesitate to contact us if you have any queries regarding the suitability of this walk, we are happy to advise. The full route takes you through the popular tourist towns of Ambleside, Coniston, and Grasmere (site of Dove Cottage, former home of the Romantic Poet Wordsworth), as well as through a few of the Lake District’s most impressive valleys – Borrowdale, Ennerdale, and Great Langdale, linked together with paths over high mountain passes, with great views of the surrounding fells. 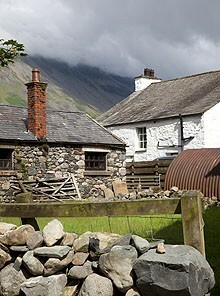 A highlight is a visit to remote Wasdale Head, in the shadow of Scafell Pike, the highest mountain in England. The Inn Way to the Lakes is a great combination, taking in the busier valleys and towns of the central Lake District, such as Ambleside, Coniston, Langdale, and Borrowdale as well as the more remote, quieter places of the western Lake District, including Buttermere, Wasdale and Eskdale – a true cross section of what the Lakes has to offer. Why is the route known as the Inn Way to the Lake District? Because it is devised so that at each day the route passes a pub at lunchtime and there will always be one nearby – or you will be staying in one – at each overnight stop. There are many traditional Lakeland Inns to choose from, – so you can plan your trip looking forward to log fires, local ales and good food, often made with local produce. ‘The Inn Way’ is a Registered Trademark of Mark Reid, author of ‘The Inn Way’ series of guidebooks. We have three options on the Lakes Inn Way. You can walk the whole route over 7 or 8 days, or do either the eastern section over three days, or the western section over four days. The eastern section takes you through the more popular tourist hot-spots such as Coniston, Ambleside, and Grasmere, as well as the iconic valleys of Great Langdale and Borrowdale. The western section takes in the quieter, western Lake District a pleasant walk along the sides of Crummock Water and Buttermere before heading into Ennerdale and Wasdale, two of the more remote valleys of the Lake District. This is the whole route, a challenging but rewarding round of the Lakeland's most dramatic valleys. Explore the quieter Western Lakes, though the remote valleys of Ennerdale, Wasdale, Eskdale and Dunnerdale. A great walk through the less visited side of the Lake District. The eastern part of the Inn way, taking in the popular villages and valleys of the Central Lakes. A challenging walk, but slightly easier than the western part. A challenging circular walk encompassing the best the Lakes has to offer. Visit picturesque Lakeland villages and hamlets. Explore the dramatic and remote valleys of Ennerdale and Wasdale. Refresh yourself in some of the 40 traditional inns and pubs along the way! Best service ever! Nice that you are an organisation from Cumbria. We can feel that you have good contacts with the different people at the locations. Also, the book with the itinerary was helpful. We’d really like to thank Mickledore for making this another stellar walking holiday. We had a really great time. We have only good things to say about Mickledore. We’ve done a number of other walking holidays in the UK and you guys are The Best. Thank you for helping to make our 2018 trip truly memorable. Thanks again, we’ll be in touch. Once again thank you for a very enjoyable holiday. We have walked in the Lake District for many years but this year, walking the Inn Way, have gained a new insight and perspective. Very impressed by Mickledore’s concern for our safe arrival back in Ambleside on the final day. Would you use Mickledore again? Yes. This is our second walking holiday with you. We remain very impressed.